No one was harmed when the float caught on fire. Dragons are supposed to breathe fire, not catch on fire. Unfortunately, the dragon float in Friday's Festival of Fantasy parade did the latter. 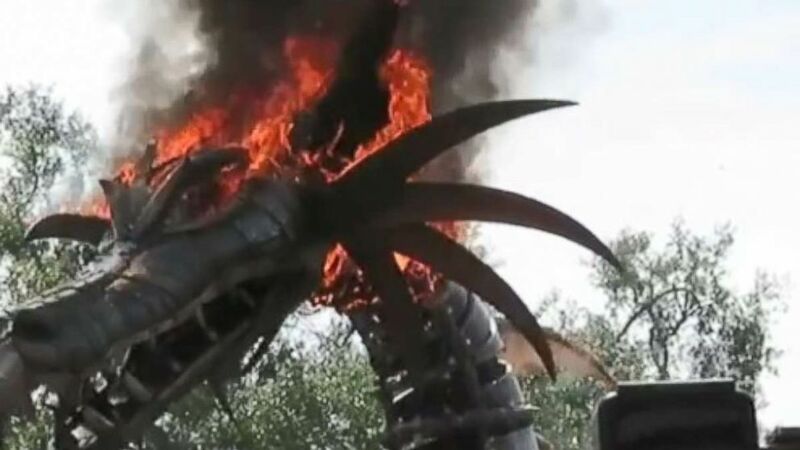 Walt Disney World's public affairs department confirmed the dragon float in its parade at the Magic Kingdom caught fire Friday afternoon. The float, which was part of a "Maleficent"-themed creation, was stopped and cast members quickly moved guests away from the float and parade, Disney said. (Holly Roberage) The dragon float in the Festival of Fantasy parade at Disney World caught fire on Friday, May 11, 2018. No one was injured. The fire was fully extinguished. Video shot by park-goers showed staff members quickly using a fire extinguisher to attempt to put out the flames. No guests or cast members were injured. Maleficent is the main villain in "Sleeping Beauty," in which she transforms into a dragon for battle with Prince Phillip. "Maleficent" was also a live-action film released by Disney in 2014 and starred Angelina Jolie as the vengeful title character and Elle Fanning as her nemesis, Aurora. Maleficent turns one of the characters in the film into a dragon at one point. In neither story is the dragon defeated via fire extinguisher.